For the purposes of my coaster count I've always considered fixed roller coasters with more than one track to be a single credit. Unfortunately this plan fails to take account of a situation where one of the tracks is relocated to a new park, leaving the original in situ. Vertigo (#1521) began life as one half of Speedy Bob at Bobbejaanland. Given that these rides are now over a thousand miles apart one cannot really consider them to be a single attraction any longer, and anyone counting them for the first time would treat them as such. In my case I'd be tempted to list the ride as a relocation were it not for the fact that the newly relocated track was closed for my visit to Bobbejaanland in 2004. As such, I claimed a new credit; it's my list, and I'll count how I like! Load four cars with people. Argue for five minutes with mother whose child narrowly misses the height restriction, before capitulating and letting them ride anyway. Dispatch the four cars with the maximum possible efficiency. Wait for all to return. Unload guests. Stand around doing nothing for a minute or two. It's fair to say that throughput was greatly limited by this approach, reducing capacity by at least seventy-five percent. While I didn't ride anything else at the park today, the visual evidence based on a thirty minute wander suggested that painfully slow loading procedures were the rule rather than the exception. Parque Warner Madrid may be the most expensive amusement park in mainland Europe, with a €38 admission ticket (roughly double that of its city neighbour) plus an additional charge of €8.50 for parking. Even with this the park was rammed with people, which suggests rather strongly that this is a particularly profitable park. Before riding anything I went for a wander around the place to see what has changed in the seven years since I was last here. The short answer is not a lot, with the only major addition being Correcaminos Bip Bip (#1522). 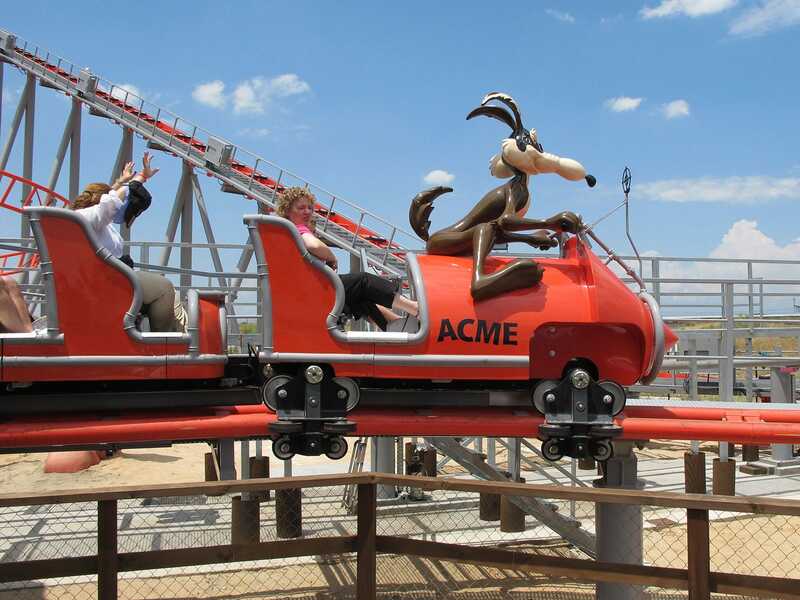 Road-runner Beep Beep is a clone of Pegasus, and it's a winner, with some good airtime and surprisingly strong forces in what is fundamentally a family coaster. There were two trains in use today, and while they were stacking it wasn't possible to fault the operators here; slow guests were the problem. It was interesting to note quite how many of those queueing for a family coaster were drinking beer while they waited. Many of those were also smoking, despite clear signage asking them not to. Having said that, this disregard for everyone else wasn't a huge surprise to me given my previous experiences with the Spanish. The only other ride I tried today was Superman, a coaster that I'd been less than flattering about on my last visit. My previous criticisms no longer apply; now that this ride has broken in it it feels much more forceful than I remembered, while still being very smooth. The only thing I did see is that there were only two trains on the ride, with the third nowhere to be seen; perhaps it has become a parts donor. 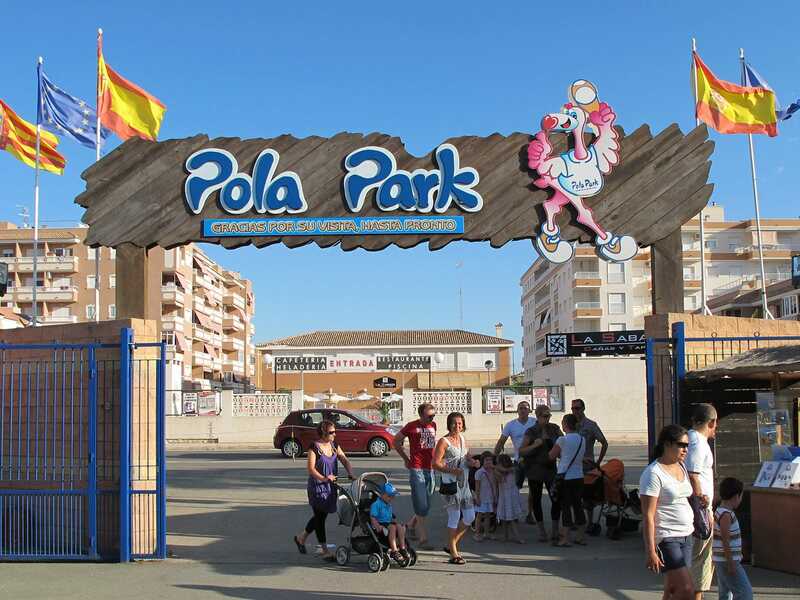 Pola Park has only a single ticket booth at the park entrance. Tonight this was likely causing a severe drop in potential earnings, due to guests dying of old age prior reaching the cashier. Eventually I managed to acquire an elusive single ride ticket for the Montaña Rusa (#1523), a particularly nice Galaxi clone located at the back of the park. With that out of the way, I wandered briefly around the rest of the place; there was an interesting looking fun house I'd have been glad to try, but I couldn't work up the courage to face the ticket queue again. I'd allowed an hour to visit Festilandia in my trip plan, which proved to be exactly the right amount of time; five minutes to ride Draky (#1524), and fifty-five minutes to find a parking space. I've no idea why anyone would voluntarily visit somewhere like Benidorm on holiday; the place strikes me as the very definition of hell, overrun with tourists and tacky shopping. The only positive note was the coaster, which was surprisingly fun for such a small ride, giving airtime on all fifteen laps of the course!